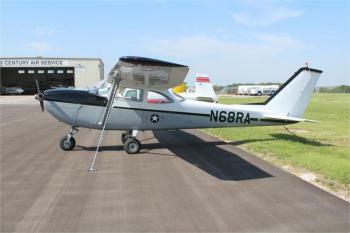 This Cessna T-41B was military #67-15119. The T-41B was built for the Army using the C-175 type certificate and has very little in common with the T-41A except the tail cone. The T-41B has a six cylinder, fuel injected, 210 HP engine, constant speed prop, quick release bailout doors, parachute type seats, both cabin windows open, both front seats fully articulate and adjust up and down, and heavy ......more.